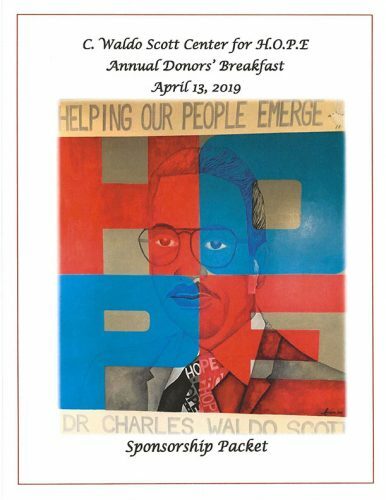 2019 Donors’ Breakfast – C. Waldo Scott Center for H.O.P.E. "We Are Part of the Story"
On Saturday, April 13, 2019, the C. Waldo Scott Center for H.O.P.E. will host our annual breakfast fundraiser, “We Are Part of the Story”. As the City highlights many stories which contribute to its richness, the Scott Center will highlight the contribution it has made to such story. Please review our Sponsorship Packet to learn how you can make an investment in our community youth through event sponsorship, securing an advertisement in our souvenir ad booklet, making a donation, and/or by attending out breakfast fundraiser. For more information, please contact Crystal Rainey at 757-244-9223 or Breakfast2019@scottcenter.org.